• Aussiedoodle dog breeders are listed below alphabetically by state / city. • Click on underlined words to see their Aussiedoodle. 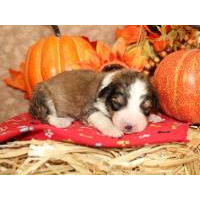 • Please tell the Aussiedoodle breeders with puppies for sale that you found them on BreedersClub.net. The Aussiedoodle is the result of cross breeding a Standard Poodle male dog with an Australian Shepherd Dog female. The result is this hybrid breed (mixed breed or designer breed). Because it hasn't been standardized, this designer breed doesn't have an agreed upon name, thus one may find it listed as some variant of the parent dog breed names. The Poodle breed lends low-shedding and low-dander characteristics. Other characteristics attricutable to the Poodle is the high intelligence factor. Some herding instinct may be passed on through the Australian Shepherd genes. We are a small breeder of quality dogs. Puppies are family raised and socialized. Ask about our health guarantee. We are premier breeders of home raised puppies. Our use of guardian homes allows us to produce top quality dogs that are well-socialized and loved in a home setting. Visit our websites to see why our pups are among the most highly desired in the nation. Our application process acts as a screening method to be sure our puppies go to only the best fit homes. If you're serious about getting a wonderful puppy, you should check us out. Your puppy will come up to date on vaccinations and with a great health guarantee. We NEVER ship puppies under any circumstances as we think it provides a terrible start. We do occasionally hand deliver puppies. Many of our adopting families come from North Carolina. We are a small kennel located on 6 acres in middle Tennessee. We have been breeding dogs for 35+ years. Our dogs/puppies are very well socialized & used to being around people/children/other pets. 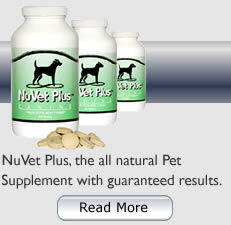 We give a 1 year written health guarantee, extended to 2 years if kept on Nuvet vitamins. Our puppies are dewormed at 2,4,6 weeks, shots to date, 1st bath & groom at 6 weeks. A deposit can be placed on choice puppy until he/she is ready to go & we keep you updated with information on how your puppy is doing along with new pictures. We have shipped in the past but prefer to have the puppy picked up in person. We welcome visitors to come see the parents & puppies in person. 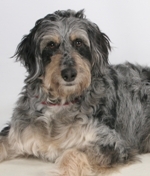 This breed directory page features Aussiedoodle dog breeders with puppies and/or adult dogs for sale. Once you purchase your new found friend, you will want to provide it the best in pet health care. Be sure to visit our online discount pet supplies catalog and order NuVet Plus™ to keep your puppy and adult dogs in top condition. The discount catalog also features collars, leashes, carriers, general pet care products and much more. BreedersClub.net does not pre-screen the breeders who advertise their puppies and dogs for sale in the BreedersClub.net breeder directory and in the classified ads. We require all advertisers to agree to our advertising terms. You should ask the breeders you talk with for references from past buyers and veterinarians. Aussiedoodle dog breeders, you may place an ad for your puppies and/or adult dogs for sale and stud service on BreedersClub.net to find qualified buyers.